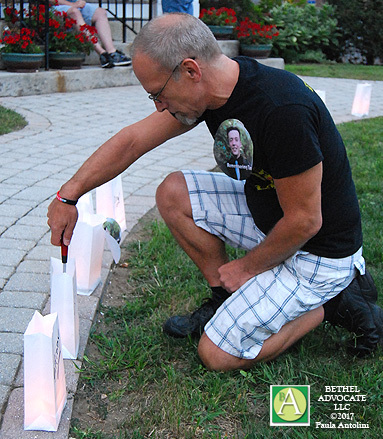 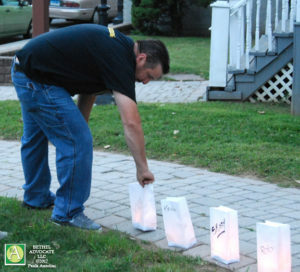 Photo: Luminaria bags line the stone walkway of the Bethel United Methodist church at the August 31, 2017, HERO Project 1st Annual Candlelight Vigil in Bethel, CT.
SCROLL DOWN TO BOTTOM OF PAGE TO VIEW VIDEOS. 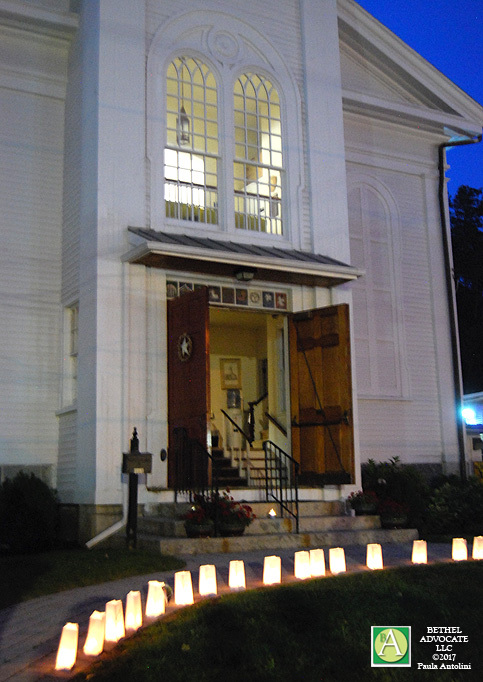 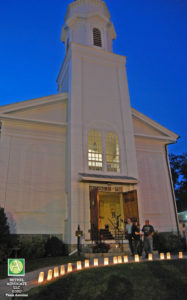 The 26 glowing white Luminaria bags, placed along the curved stone walkway in front of the open doors of the Bethel United Methodist church, were inscribed with names of those lost to addiction. These individuals were shining bright in the hearts of those who loved them, at the 1st Annual HERO Project Candlelight Vigil and Food Drive, on Aug. 31st. Food was being collected for the Bethel Community Food Pantry (located in the basement of the church). This event was being held simultaneously in various towns across the state and nation, on International Overdose Awareness Day. Approximately 35 supporters stood silent on the lawn of the Bethel United Methodist church, as they held lit candles in remembrance during the vigil, while the names of those who passed were read aloud by Pastor John Parille. 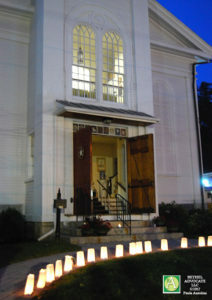 The church chimes rang out simultaneously like melodic tears in the cool air of the night, as the sky darkened. 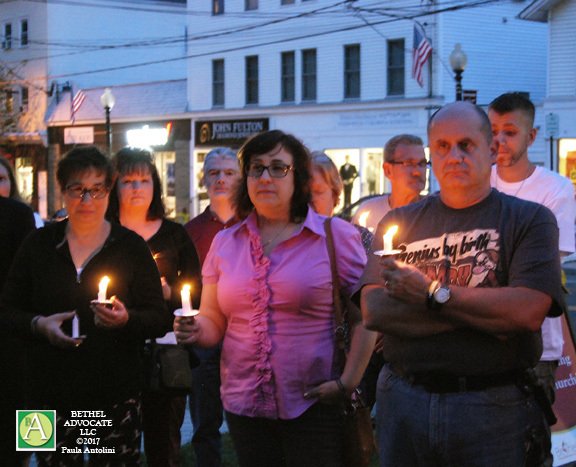 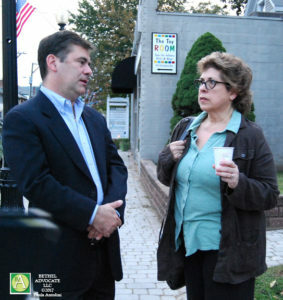 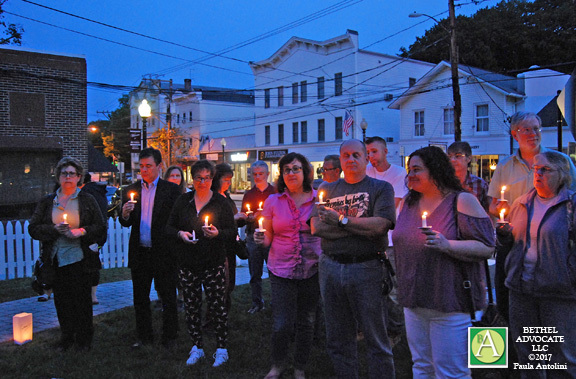 Photo: Supporters hold lit candles and stand in silence at the August 31st, 2017, HERO Project 1st Annual Candlelight Vigil in Bethel, CT. On the left is the 2017 First Selectman candidate Cynthia McCorkindale and second from left is CT State Representative Will Duff. 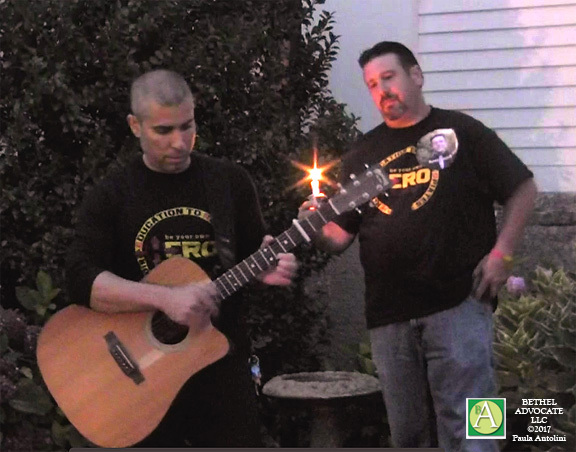 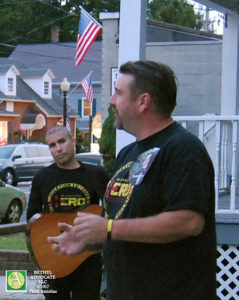 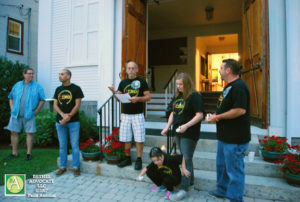 The HERO Project held its 1st Annual Candlelight Vigil & Food Drive on International Overdose Awareness Day, August 31, which took place on the front lawn of the Bethel United Methodist Church located at 141 Greenwood Avenue, in Bethel, CT.
Don Olson spoke first, and said he was at the vigil in memory of his nephew Timothy Vail, 23 years old, who lost his life to addiction. 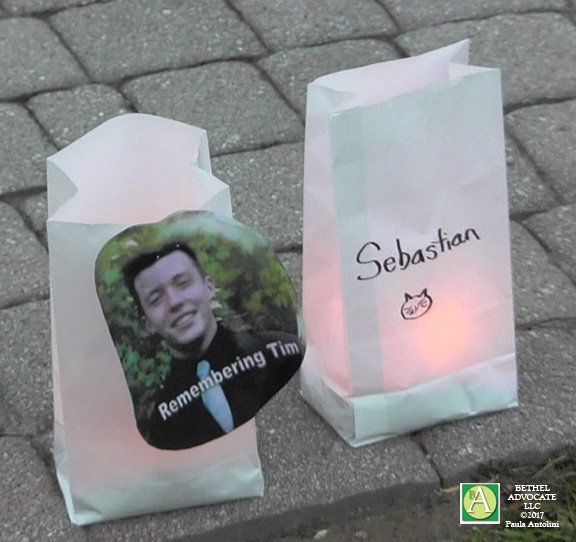 “Great kid, a lot fun, died from a heroin overdose,” Olson said. 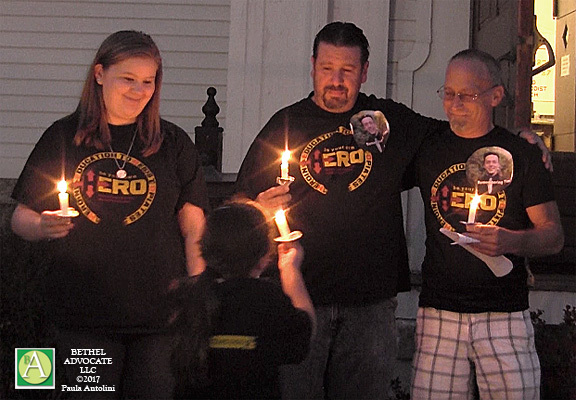 “We have this little hashtag we do that’s called #letsHERO. 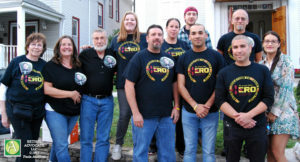 Well right now we are HERO,” said Olson. 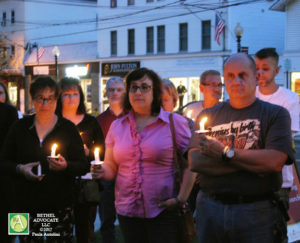 Olson said, “Our mission is to stop the problem before it starts.” We do this through education, letting families and young people, and people of all ages, know about the epidemic that’s taking over, Olson said. 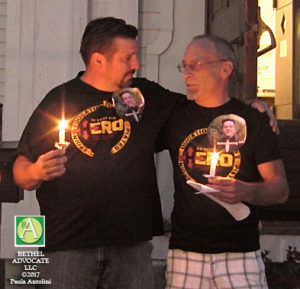 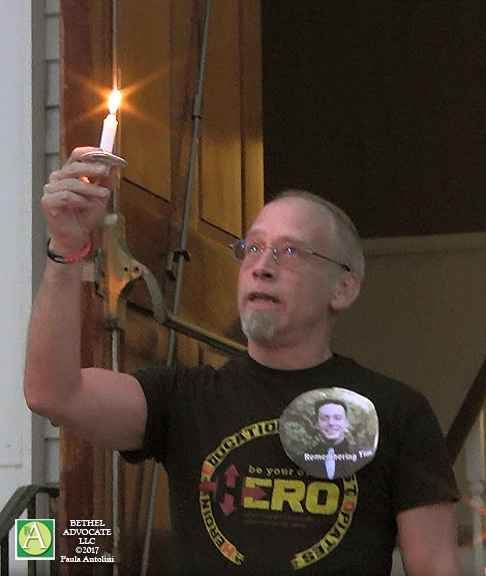 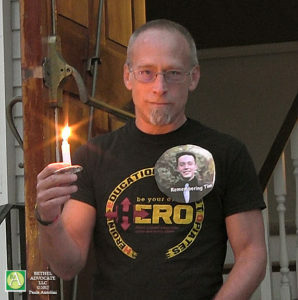 Photo: HERO Project President Jeff McKenna holds a candle up during his speech at the August 31, 2017, HERO Project 1st Annual Candlelight Vigil in Bethel, CT.
Pastor Parille, who graciously allowed the event to take place on the front lawn of the Bethel Methodist church, said, “I saw this as two events in one because it’s an event of remembrance, but it’s an event of hope.” He said the work that was being done by The HERO Project is “shining light into the darkness,” as he credited founder Don Olson as saying. Guitarist Marc Huberman provided beautiful music on acoustic guitar, during the event. 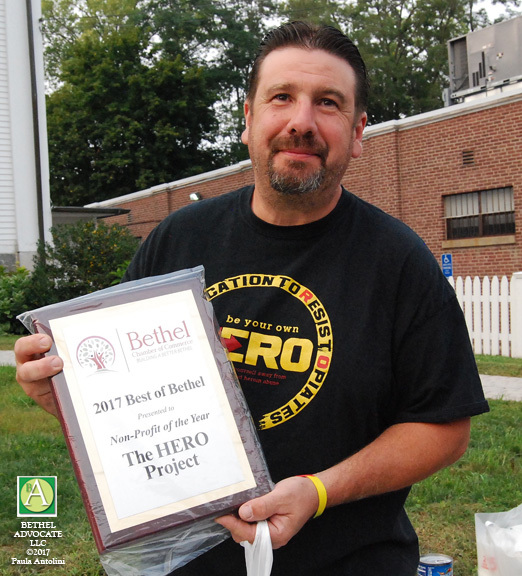 The HERO Project recently received an award for “2017 Best of Bethel Non-Profit of the Year” from the Bethel Chamber of Commerce. 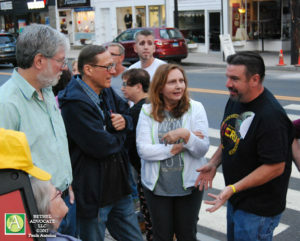 VIEW MORE PHOTOS OF THE EVENT BELOW (and VIDEOS are below photos). 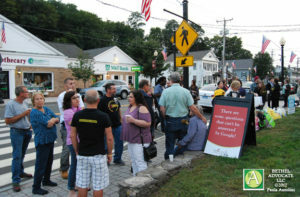 Photo: Some of the members of the HERO Project group at the August 31, 2017, HERO Project 1st Annual Candlelight Vigil in Bethel, CT.
Photo: A crowd gathers on the sidewalk in front of thr Bethel United Methodist church at the August 31, 2017, HERO Project 1st Annual Candlelight Vigil in Bethel, CT.
Photo: HERO Project founder Don Olson chats with supporters at the August 31, 2017, HERO Project 1st Annual Candlelight Vigil in Bethel, CT.
Photo: HERO Project President Jeff McKenna lights s a Luminaria candle at the August 31, 2017, HERO Project 1st Annual Candlelight Vigil in Bethel, CT.
Photo: (Left) 2017 First Selectman candidate Cynthia McCorkindale chats with CT State Representative Will Duff at the August 31, 2017, HERO Project 1st Annual Candlelight Vigil in Bethel, CT.
Photo: HERO Project founder Don Olson places Luminaria bag on the sidewalk at the August 31, 2017, HERO Project 1st Annual Candlelight Vigil in Bethel, CT.
Photo: HERO Project founder Don Olson (right) gives a speech at the August 31, 2017, HERO Project 1st Annual Candlelight Vigil in Bethel, CT.
Photo: Marc Huberman plays beautiful music on an acoustic guitar as HERO Project founder Don Olson looks on, holding a candle, at the August 31, 2017, HERO Project 1st Annual Candlelight Vigil in Bethel, CT.
Photo: (Center) Mrs. Olson, mother of HERO Project founder Don Olson (partially shown far left) embraces another HERO Project member, at the August 31, 2017, HERO Project 1st Annual Candlelight Vigil in Bethel, CT.
Photo: (Left) HERO Project founder Don Olson, is arm in arm with HERO Project President Jeff McKenna, as they share a poignant moment at the end of the August 31, 2017, HERO Project 1st Annual Candlelight Vigil in Bethel, CT.
Photo: HERO Project founder Don Olson holds the award recently presented to the HERO Project for “2017 Best of Bethel Non-Profit of the Year,” and the award was proudly displayed at at the August 31, 2017, HERO Project 1st Annual Candlelight Vigil in Bethel, CT. Thanks to founder Don E. Olson, a small group of concerned citizens gathered in Bethel a year and a half ago, to brainstorm about how to bring awareness to the heroin and opiates addiction problem plaguing young people in our Connecticut communities, and how to save lives. 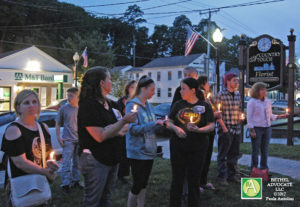 They quickly realized there are many aspects to address concerning this issue including how to determine if your child is at risk and what parents can do, or who whom they can turn for advice or solutions, if there is a problem with drugs. The group offers information and sources to lead you to the professionals in the field. 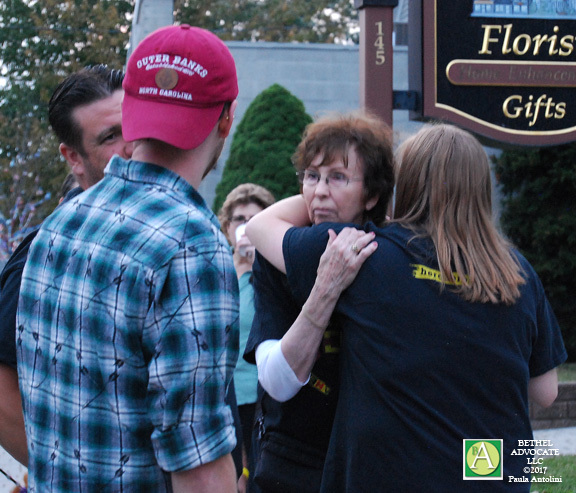 Their aim is to create awareness about addiction, but they do not tell you which choice to take for help, recovery or rehabilitation, as each case is individual and may work differently, for different individuals or situations, based on many factors. 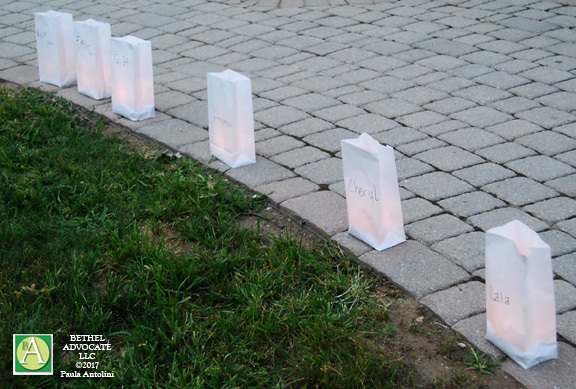 They instead provide much information and sources for you to decide upon based on your particular situation. They have held many public events, such as the “HERO Town Hall” and “Pizza Challenge” to fund raise and spread awareness about opioids addiction and recovery.